Hinge doors which are made using the patented and patent-pending Sing Core technologies are celebrated around the world as being the best pivot doors in the world. Why Do You Need Sing Core Inside Your Hinge Door? THAT is why you need Sing Core inside your door. Using Sing Core is the only way to build a lightweight Hinge door that is stronger than steel which comes with a full warp-free and structure guarantee for 50 years. What makes a Hinge Door with Sing Core inside so unique? Only hingedoors with Sing Core inside are lightweight, high strength, fully insulated, available in vast array of skin types such as natural wood stave, any flat wood-based sheet goods, alternative and hybrid skins, and/or metals. Any size large oversized hinge door up to 50 ft. Best hinge door guarantee in the world: 50 years! Designers and Architects are establishing a new trend in the architectural impact of structures that garner attention at first glance by greeting visitors with a large hinge door. The larger the front hinge door, the more impressive and attention-grabbing. Large hinge front doors create the greatest impact when a structure is seen for the first time. These oversized hinge door are big and thick, and the bigger the better. These big hinge doors are taller, wider and heftier than other traditional front door styles. Even real estate developers are installing large hinging entry doors in high end homes for that extra hit in the curb appeal presentation. Though some door manufacturers build and stock standard hinge doors, ready to install, the high end large hinge doors are custom manufactured for each installation by millworks, craftsmen or custom door manufacturers. Each hinge door is like an individual work of art. Sing Core specializes in supplying the best millworks, door companies and custom door manufacturers with the best base doors built to architectural specifications ready for the installation of standard side hinges for any type of predetermined door swing, such as inswing, outswing or a double swing door which swings both inward and outward, as a more specialized hinged door. Why Sing Architectural Standard Swinging Hinged Doors? The main reason why architects, designers and door manufacturers seek out Sing Core for their architectural swinging doors is because their clients are not interested in standard pre-hung hinge doors that you can buy off the shelf. These are the most demanding clients who know what they want. They want the best of the best; a high end door created according to their needs, wants and desires, in whatever size they want, that incorporates only the best materials and craftsmanship possible. What does it mean to be The Best of the Best in Architectural Doors? The best doors have Sing Core inside and are finished by highly skilled craftsmen who put all the love, attention and skill into the fine details matched with the best hardware which results in the most exquisite high-end one of a kind hinged door that is a work of art and clearly the best of the best. An Eco-friendly, sustainable, fully insulated hinged door with is lightweight, high strength and can be guaranteed not to warp, bend, twist, or otherwise fail (including full structure warranty) for 50 years! 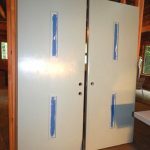 What hinged door sizes are available? A hinged door with Sing Core inside can be any size. The greatest majority of Sing doors sizes are 4×8 hinged doors and larger, up to 50 ft tall large oversized doors (or more). The main reason why only the best architects specify having Sing Core inside their large doors is due to the unique characteristics of patented Sing Core, which helps to create the only Eco-friendly, lightweight, high strength hinged doors that can be guaranteed to remain warp-free for 50 years. Sing Core is featured inside a growing number of hinged doors that are operated automatically by mechanical apparatus. Sing swinging doors have superior compatibility for automatic door openers and closers due to their extreme lightweight and high precision. These warp-free swinging doors which are available in any size outperform other swing automatic doors which cannot be covered by a 50-year no-fail guarantee. Plus, the lighter weight of Sing swing automatic doors means lower cost of automation which is based on the weight of the swinging door. 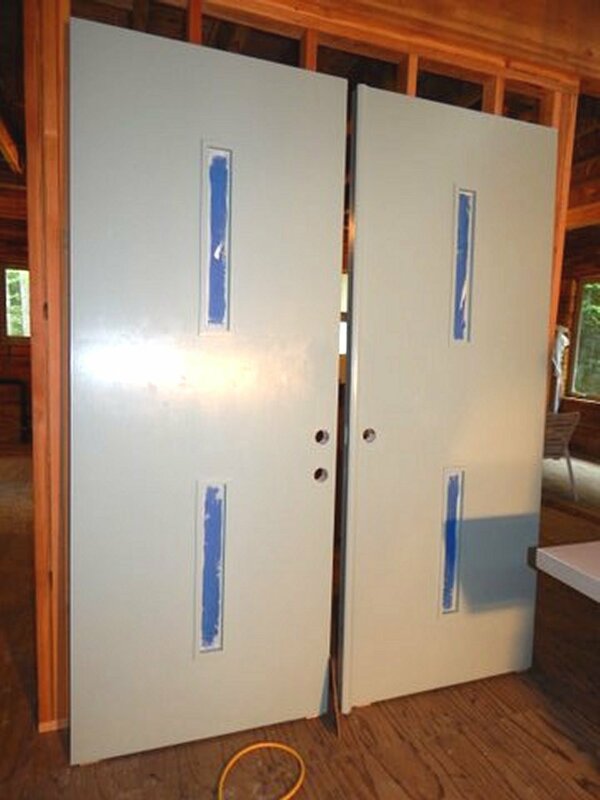 You can now have large oversized hinged doors, like these 9-and-a-half ft. tall doors that you never have to worry about warping or servicing because the wood moved. These hemlock wood stave doors are very tall and made of beautiful wood, insulated Eco-friendly doors that won’t warp, bend, twist or otherwise fail, guaranteed for 50 years. No other sustainable door over 7 ft. tall could offer such a guarantee while being lightweight and high strength. And who’d have guessed the designer would have cut the lite openings to be used in what appears to be an upside-down orientation for safety? You can even see the kids on the other side of such a big door. Excellent design feature. While large swinging door can maintain a certain level of straightness over time by building up the side hinges by increasing the number of hinges or even using a continuous hinge also known as a piano hinged door, working with a warp-free door slab is the preference of high end clientele, in upscale homes as well as commercial and industrial applications. How does Sing Core make Warp-free Doors? Keep in mind, Sing Core does not make doors. We only make the patented door core or substrate material that is high precision (+/- .006 in.) Eco-friendly (responsible use of natural and recycled material), fully insulated (starting at R3.5 per in. ), lightweight (66 to 90 percent less than other heavy solid door core materials), and high-strength (660 PSI, stronger than steel pound for pound) for the most sustainable long-life warp-free results (50 years, guaranteed professional grade). What’s the Secret of Patented Sing Core? Sing Core’s patented hybrid composite structure consists of melding age-old wood craftsmanship with new recycled structural insulated panel technology to create this one-of-a-kind lightweight, high-strength, warp-free hinged door solution. Starting with a vertical gain torsion box grid structure, only instead of leaving the boxes empty, the hollow portions are filled wall to wall with rigid recycled structural foam insulation. This composite structure grid is sandwiched between to exterior structural skins (could be any flat building material) and pressed together using formaldehyde-free adhesives. Of course, the one-of-a-kind piece of art-style large hinged doors are going to be the most expensive but large door companies do come to us for regular-sized doors that are specified as having Sing Core inside. Small runs are made to accommodate these requirements for jobs where even the regular-sized swinging doors are made with Sing Core inside. No matter what kind of door you want, door companies, architects, and custom door manufacturers may see your specific hinged door, set of hinged doors, or other types, styles or sizes of doors to be outside the spectrum of their normal capabilities. Sing Core is their backup for the difficult, challenging and large oversize door manufacturing which is not a part of their normal operation. Now, you can still deal with the same door manufacturer who is providing the rest of your doors without having to custom outsource your unique specialty doors. By simply specifying, “Sing Core inside,” the challenges vanish, without compromising timelines. The most economical way to obtain Sing swinging doors is to order in bulk. To qualify for special discount pricing on bulk orders, consider a bulk order of 100 doors of any size (all the doors do not have to be the same size. They can all be different sizes and still qualify for bulk pricing). Unfinished door blanks will be shipped to the door company, millwork or custom door manufacturer for finishing. Our factory is specially outfitted for large bulk orders of swinging doors. We are the unspoken backbone of door manufactures that might have to retool their factory for a particular run of doors. Rather than go through that extensive retooling process, they send the order off to Sing Core which rapidly builds and ships the doors in about the time it would take to tool and retool their facility for the run. We recently just completed a bulk order of 700 doors for a door company on the East Coast. The popularity of Sing swinging doors are sweeping the nation garnering more attention by the most exquisite contemporary architects, designers and engineers. And thanks to the door companies with which we work (including some of the largest door companies in the world) you can find hinged doors swinging in homes, hotels, hospitals, universities and science labs anywhere from below the sea (US Navy) to outer space (NASA) and everywhere in between. 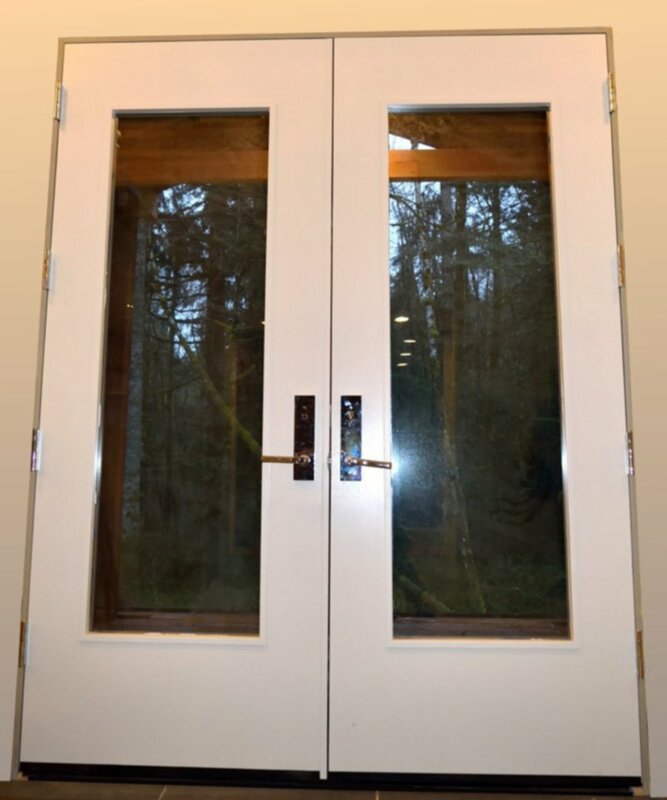 Sing swinging doors can be retrofitted for any size opening in any swinging door style. Custom glass window lite cut outs can be precut in any door design at our factory prior to shipment. Unique glass openings are unlimited and can be CNC cut to your drawing(s) or architectural specifications. Sing swinging doors can be taller and wider than any standard doors available, up to 50 ft tall, or more, and still be covered by our full 50-year warp-free guarantee, even if the door is made with solid wood stave (which is always a challenge for any door over 7 ft tall). Sing Core is your source for hinged doors and swinging doors which can be tall and wide, yet still maintain a slim profile without compromising strength, structure or 50-year guarantee for premium hinged doors. Architects, door companies, millworks and custom door manufacturers are invited to contact us directly.